Installing a ThermoGuard EGT Gauge kit is quite straightforward but generally does require some skilled use of tools. Well-equipped 'home mechanics' should have no difficulty with the fitting but those without suitable experience or equipment might be better advised to seek the services of an experienced diesel or turbo-charger specialist. 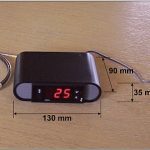 The following sections describe in general terms the fitting of the thermocouple sensor and the indicator unit. However, each make and model of vehicle may present slightly different problems in choosing the optimum location and access for installation. The ThermoGuard EGT Gauge kit includes a heavy-duty industrial-quality Type K thermocouple to sense EGT. It is a mineral insulated, metal sheathed (MIMS) unit with a 6 mm diameter stainless-steel sheath, capable of many years of reliable service when installed correctly. The sensor is fixed into the engine's exhaust system using a stainless-steel compression fitting. Installing an EGT sensor downstream from a turbo-charger will result in temperature measurements which may be several hundred degrees C lower than those upstream of the exhaust turbine in certain circumstances. This temperature drop is largely unpredictable and may give the driver a false sense of security unless a lower temperature limit is adhered to. However in some vehicles, access to the exhaust manifold is simply too difficult and/or the owner is not prepared to strip the engine to the extent necessary to install in the manifold. Some owners also find that their aftermarket free-flowing exhaust systems already have a sensor mounting point fitted to the turbo outlet pipe. In these cases, the owner may prefer to use a downstream sensor location and accept the compromises of this location. In my opinion, by far the best location for installing an EGT sensor is in the exhaust manifold, upstream of the turbo-charger exhaust turbine inlet. As the exhaust gas expands through the exhaust turbine, the pressure and temperature of the gasses reduces markedly. However, it is the hotter upstream temperatures to which the vital turbo components are subjected. That is, the turbine housing, turbine blade tips and wastegate valve 'see' the hotter upstream gas, which can heat them to damaging temperatures. A location which samples the exhaust gas from all cylinders (or all cylinders in one bank, in the case of a 'vee' engine) is desirable, rather than a location which effectively samples the exhaust from only one or two cylinders. Regardless of the location chosen, the thermocouple sensor is fixed to the engine with a stainless-steel compression fitting supplied with each kit. In almost all modern turbo-diesel engines*, it is necessary to drill a hole through the exhaust manifold and cut a thread into it to enable the compression fitting to be screwed in. Any competent diesel or turbocharger specialist should be able to perform the drilling and tapping of the manifold. We are able to supply the correct size drill bits and thread taps, if required. * The Land Rover 300Tdi non-EGR engine (Australian specification) is an exception. 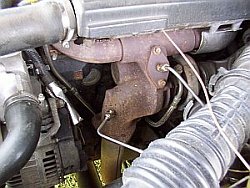 A number of aftermarket exhaust systems include a threaded boss welded into the exhaust pipe, just downstream of the turbo-charger. This is often a 1/4" BSPT female fitting. In this case, we can substitute a 1/4" BSPT male compression fitting in the ThermoGuard EGT Gauge kit, if requested, at no extra charge. Australian-made DTS and MTQ aftermarket turbo systems have an M18 x 1.5 metric threaded boss. For these systems, we can supply a suitable adapter for a small additional charge. Compression fittings with other sizes and types of thread (e.g. American NPT thread) are available if required. 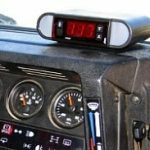 The ThermoGuard EGT Gauge digital indicator has a bright red LED display which is easily viewable in daylight and at night. 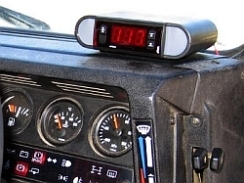 The indicator unit is intended for mounting into a flat panel. The indicator front panel is 77(w) x 35(h) mm. It requires a rectangular cut-out of 71 x 29mm. The unit is 77mm deep but, as the wiring is rear-connected, about 90mm depth is required behind the front panel. Th e unit includes removable ratchet clips to ensure a snug fit to the panel. 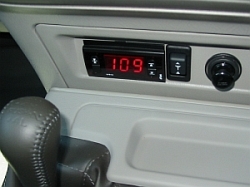 If an in-dash installation is not possible or not desired, the indicator may be supplied in an optional rugged ABS plastic Instrument Case. 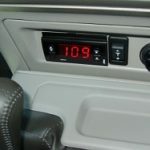 This can be attached on or under the dash and makes it particularly easy to transfer the indicator between vehicles. 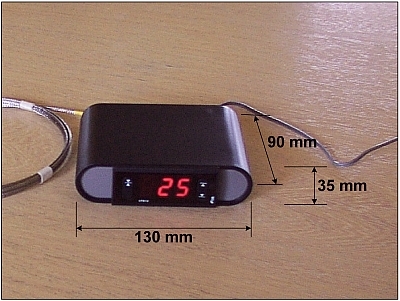 The Instrument Case is 130(w) x 35(h) x 90(d) mm. 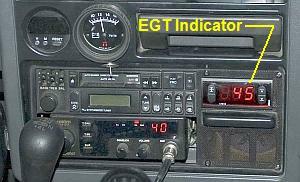 So, having installed your EGT gauge, how do you make use of the information it provides? 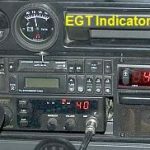 Most users are initially surprised by the sensitivity of the EGT gauge to small changes in fuelling (throttle position) and engine load (slight grades, headwinds etc.). 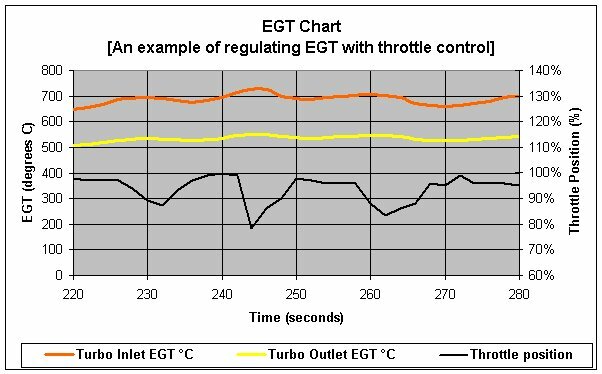 EGT is very closely related to the instantaneous rate of fuel burn in the engine and reacts very quickly to fuelling changes. As a result, there is no "normal operating temperature" for any particular engine, although it will often be somewhere in the range 200 to 400 ºC while cruising at part throttle. When does excessive EGT occur? Before we talk about actual peak temperature levels, we need to again discriminate between upstream (pre-turbocharger) and downstream (post-turbocharger) locations for the temperature sensor. Under high load conditions, there will be a large difference between upstream and downstream EGT. As the exhaust gas expands across the turbine and provides the energy to drive the air compressor, it's pressure and temperature are both markedly reduced. There is a consensus of international sources which suggest that sustained gas temperatures in excess of 720 ºC (~1330 ºF) upstream of a diesel turbocharger will result in progressive and irreversible damage to components in contact with the gas. These may include piston crowns, exhaust valves/seats, manifold and, most commonly in the case of turbo-charged engines, the turbo-charger housing, exhaust turbine and waste gate. A pre-turbo measurement is an 'absolute' measurement - that is, it is the actual temperature to which the turbine blade tips, the wastegate and the turbine housing are being subjected. The temperature drop across the exhaust gas turbine is difficult to quantify. It will vary with load, speed and will be different for every engine design. A post-turbo measurement requires assuming a 'worst case' temperature drop across the turbine and subtracting that from 720 ºC to arrive at a suitable limit for downstream EGT. I have measured almost 200 ºC difference between turbo inlet and outlet temperatures on my Land Rover 2.5L 300Tdi under full load conditions, so I recommend 520 ºC (~970 ºF) downstream as a safe limit for such installations. This will be quite safe in the vast majority of cases but it is also probably overly conservative in some cases, especially large capacity, relatively low-boost (i.e. <10 psig) standard engines. Very high EGTs will usually occur only at full throttle and high load conditions, such as driving up a steep grade or towing heavy loads. Further, these conditions will usually need to continue for some tens of seconds before EGT climbs to peak levels. This is because the exhaust manifold (and turbocharger, in the case of downstream installations) acts as a large heat sink and absorbs heat from the exhaust gas for some time after the engine begins working at full load. This is not a problem as this slightly lagging measurement probably more closely matches the metal surface temperatures in the turbocharger which are, after all, our main concern. A stock-standard factory turbo-diesel may never generate an EGT higher than, say, 650/500 ºC (we'll use 'upstream'/'downstream' values for the rest of this discussion, OK? ), due to the conservative factory set-up and their need to keep the engine 'safe' under most foreseeable conditions. But it may still generate high EGTs under abnormal conditions which cause an air flow restriction or lower than specified boost pressure (high altitude, very high ambient temperatures or failures such as blocked air hoses, air leaks, fouled intercooler etc.). The conservative nature of the factory set-up creates a broad envelope for the aftermarket 'tuners' (and chip programmers, in the case of electronically controlled turbo-diesels) to exploit and to offer significant improvements in peak power and torque. And if you're using that extra output to the full, your engine will certainly be generating higher EGTs. But you don't have to run at high EGT levels, no matter how 'hot' the tuning is. You can control the maximum EGT levels under all circumstances. With an EGT gauge installed, you will know what the EGT is at all times and can decide at what level you want to limit your own engine by backing off the throttle a little. For example, let's say an overzealous diesel engine 'tuner' set up your injection pump so that the EGT is about 750/550 ºC when at full throttle and full load on a chassis dynamometer. That doesn't mean you ever have to run it that hot in actual use. You can choose to ease off whenever it reaches or exceeds 700/500 ºC. You will still have the benefit of being able to use all the extra performance available for short periods such as overtaking but not run the risk of exposing your turbo to excessive temperatures on, say, a long steep climb in hot conditions. By the way, this 'backing-off' doesn't mean you have to lift right off the throttle in the middle of a steep climb. Just easing off a couple of mm from full throttle is usually enough to get the EGT to stop rising and either stabilise or slowly fall - the Americans call it "driving by the pyro". Of course, should EGT rise very rapidly towards the danger zone (in under 10 seconds, say) it is likely the engine is seriously overfuelled and in need of some 'de-tuning'.